Well, I've been quiet the last couple of days; but I have been busy as you can see! Today I have three cards to share with you. The first is for yesterday's Mojo Monday Sketch. Now, I have to say that it didn't come out exactly the same as the sketch; but close enough as they say.The panels on the side and the middle should have been longer. Either that or my sentiment should have been smaller at the bottom. I used Chocolate Chip, Kraft, Tempting Turquoise, Very Vanilla for the colors. 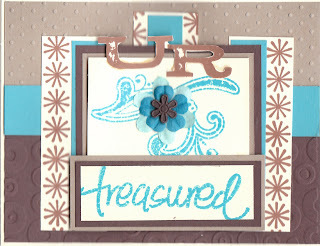 The stamp set is from LYB "Friends" set and everything was stamped in Chestnut Roan Chalk in k and Tempting TQ ink. The second card is for today's SCS sketch challenge. 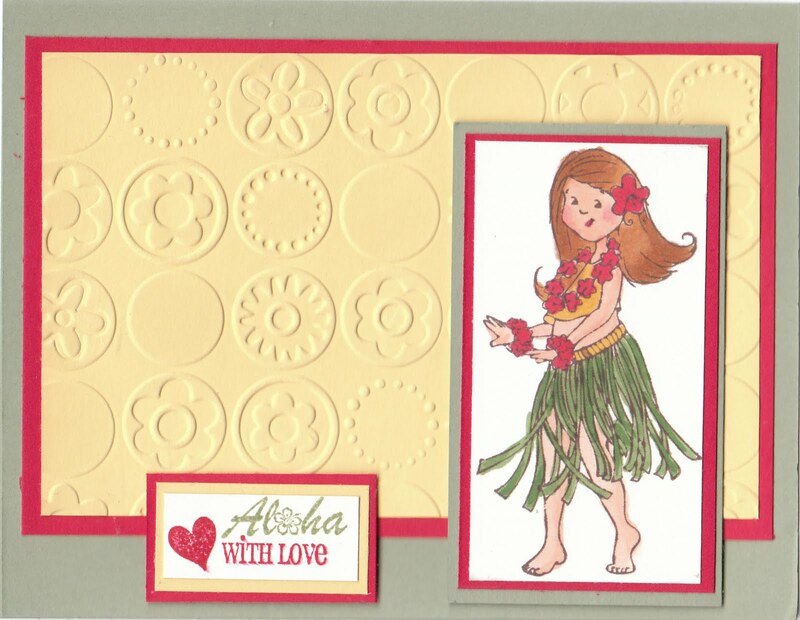 Now, I switched the two smaller panels so that my Hawaii girl would be facing "into" the card and not "off" the card. For this card, I used a SCS color challenge from a while ago using Barely Banana, Real Red, and Mellow Moss. This was a very nice color combination and one that I think I shall use again. I really liked how the boldness of the Red contrasts with the softness of the Moss and the Banana. I used a Paper Pretty Stamp for the main image, stamping her in Momento Cocoa ink and then coloring her in with a variety of Copic Markers. Finally the last card I have is for a SCS sketch challenge that I missed whi le I was on my blogging break earlier this summer. I think it is #285. For this card I used Teal, Olive Green and Melon Mambo. The flower stamps on the side squares are from Inkadinkado and the sentiment in the middle is from SU's "sweet little sentiments." Ok, must run...domestication calls! Have a great evening and I'll be back in a couple of days with some more to share. WOW! You are on a roll! So many beautiful cards! TFS! These are great cards, love the little hula girl, but red is my favorite color. You sure have been busy in the craft room. All three are great, but my eye is really drawn to the third card!